You want to open your closet and feel instant clarity on what to wear. Then you want to feel joy because you know you love everything in your closet. Each item makes you feel great for more than one reason. Every outfit is comfortable, easy, and suits your individual lifestyle. Everything works together. You know what you have and you can see each item because your closet now has breathing space. 1. 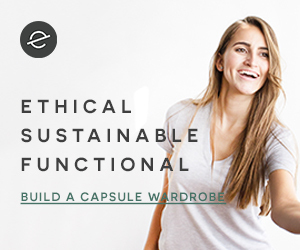 Choose ethically and sustainably made new clothes. If you're going to go minimalist, you might as well make your choices count for other people and for the Earth. This is the part where you clothes feel great in more than one way. They flatter you and you feel good because you're not part of the fast fashion cycle of destruction and abuse. I never buy new clothing unless the company has a commitment to ethics and sustainability they specifically mention on their website. Also, there is a website that allows you to look up specific companies for their practices and you can see their grade. 2. When shopping for basics or need to buy cheap, thrift. I love shipping thrift stores. When I buy second-hand, I allow myself to buy no matter what the brand is. Hey, you gotta draw a line somewhere. I do look for brands that follow ethical and sustainable practices even in thrift stores. Thrift stores are for me a great way to shop for basics. Thrift stores are a great way to save money and embrace sustainability in your personal shopping choices. 3. Fall in love with neutrals. For me, even though I love bold color, neutrals are the key to a cohesive minimalist wardrobe. Most everything I wear goes with everything else because I have a lot of black, tan, and gray. It just works. If you don't embrace neutrals, you end up with closet full of clothes and nothing to wear. I like to embrace color and fashion with on-trend accessories or vintage jewelry that may not be in style, but is in a color I just love. 4. Follow your own style guide. Instead of shopping trendy colors that will disappear next season, choose colors that you love. My sister created a style guide for me. It has both neutral and bright colors and it serves as a guide when I shop. If an item is a color that is not on the style guide (or a neutral that goes with the colors in my style guide) I don't buy it. Easy peasy. 5. Find a couple companies you LOVE and feel good about supporting. I love softy, cozy, comfortable clothes that are flattering, have a bit of stretch, and are well-made. I fell in love with Encircled and decided to partner with them (I'm a proud affiliate and here's my link!) because their clothes are perfect for minimalist-mom-yogi-cyclist-nomads. AKA, ME. And maybe you. When you find an ethical company you love to buy from, and you identify a few key pieces that fit you well, you can buy multiples or quickly replace anything that becomes worn out or damaged. Check out this tee (the "nomadic v-neck") -- it's a foundation of my current capsule! And here's an "unboxing" of my new Encircled. Leggings. Update: Almost a year later they are still my favorite leggings. 6. Final, bonus step! 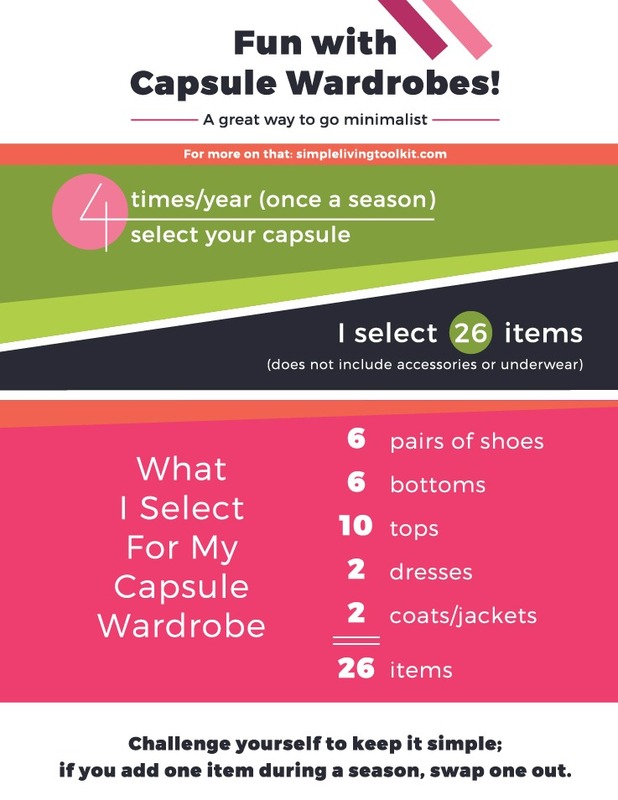 Know that there's no one way to do a minimalist (or capsule) wardrobe. I've had large, medium, and small wardrobes. The exact number of items (and what I include in the count) changes. And finally, here's yet another list (and beautiful graphic you can download or Pinterest for your reference) that you might find useful. Basically, have fun with this process! There's no one right or wrong way to do it. And if you're looking for more decluttering inspiration that extends beyond your closet, join the 3-Day Decluttering Challenge by signing up right below. Spring is a great time (the best time, maybe) to clean out your home and even declutter your schedule. Join the decluttering challenge today!